Mario Merchan is a self-taught artist specializing in oils on canvas. His work is very much reflective of his own upbringing, as well as the raw human emotion and experiences of others. 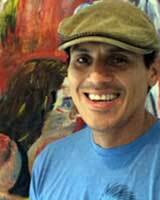 Born in Guayaquil, Ecuador and raised by his grandparents, Mario draws much of his inspiration from childhood memories – mornings riding to school on the back of his grandfather’s bicycle, playing soccer barefoot on the streets with neighborhood children until dinnertime, wandering the woods picking mangos with friends on weekends, and countless hours drawing and painting on his patio with his eldest cousin, Eduardo. Mario’s life changed dramatically as a teenager. He left Ecuador to immigrate to the United States when he was 14 and moved in with his mother and stepfather in New York City’s Washington Heights. He attended George Washington High School before putting himself through community college. In his spare time, Mario painted. With no studio space or room to store his work or supplies, he would paint atop the same canvas, picture upon picture, again and again. Necessity led to his own specialized technique and passion for layering color, and to his philosophy that no painting is ever truly finished. Today Mario’s works are created through the Mi’Jos Studio. Short for “mis hijos”, or “my children”, it represents his greatest source of inspiration, his own hijos, Mylo and Layla. Painting in oils with a passion for texture, Mario adds layer upon layer of color, interpreting a moment in time – its sights, sounds and feeling – until the image in his mind speaks out onto the canvas. Copyright 2019 Piermont Flywheel Gallery All Rights Reserved - Artworks are owned by individual artists who retain the full copyrights to their works and images.